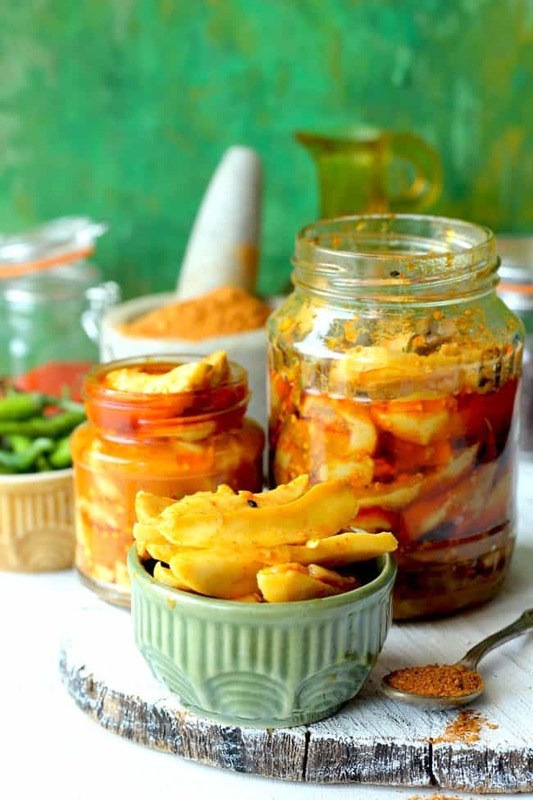 Instant Mango Pickle is a delectable mango pickle recipe that is ready to eat in few hours. Is that even possible? Yes, it is. The Instant Mango Pickle is the kind of recipe that saves you hours of labour in the kitchen. Now you can make pickle whenever you want without waiting for the bright sunny day. 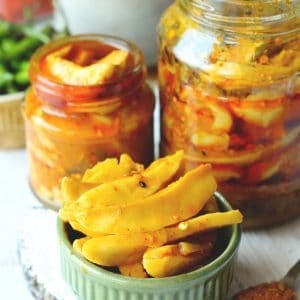 All you need is raw mangoes and few spices to make this Instant Mango Pickle. And the best part is it is a no-cook pickle recipe. There is no stove-time involved in this recipe. 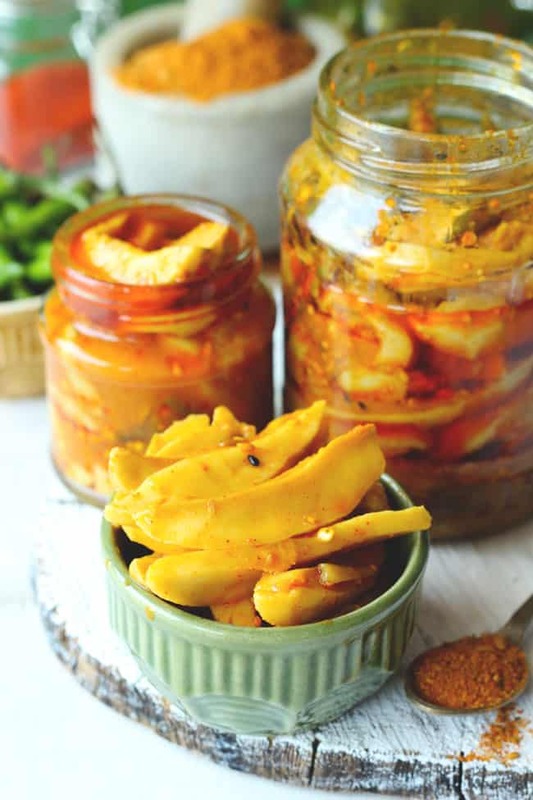 So for the novice pickle makers, this Instant Mango Pickle recipe is worth bookmarking. There is always a debate going on inside me whether the traditional Punjabi Aam Ka Achaar or an Instant Mango Pickle is my favorite. I like them both to the core. But making a conventional aam ka achaar is an art that requires a bit of practice and experience. 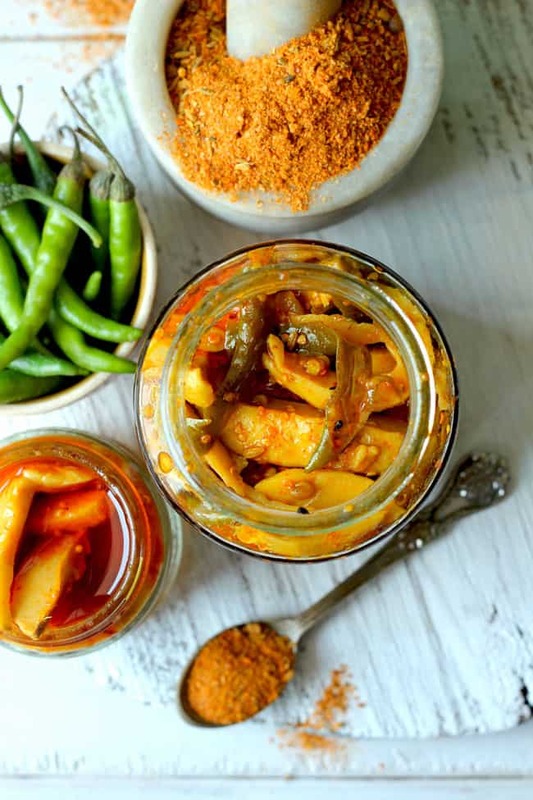 While an Instant Mango Pickle is an easy peasy condiment that can be prepared without any significant nuisance. So I think my vote will be in the favor of Instant Mango Pickle. But for both the recipes or any other pickle recipe I stick to homemade achaar ka masala. That I prepare in large batches and store in a clean, dry airtight container. 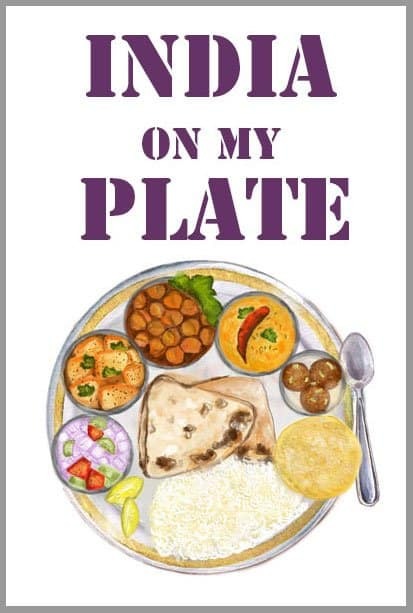 Apart from pickles, it is perfect to season dishes like Besan Bhindi Fry and Achaari Paneer Tawa Pulao. You can use the store bought pickle masala too for this recipe. Making achaar ka masala from scratch at home for this recipe is definitely not a compulsion. The shelf life of an Instant Mango Pickle is usually not more than a month. So it is best to make it in small batches. Many people store this pickle in the fridge to increase the shelf life. But instead, I prefer making it in small batches and consuming it quickly. I forgot to mention adding green chilies to this pickle is totally optional. But they definitely add an addictive spiciness to this Instant Mango Pickle. And also balance the sourness of the raw mangoes. 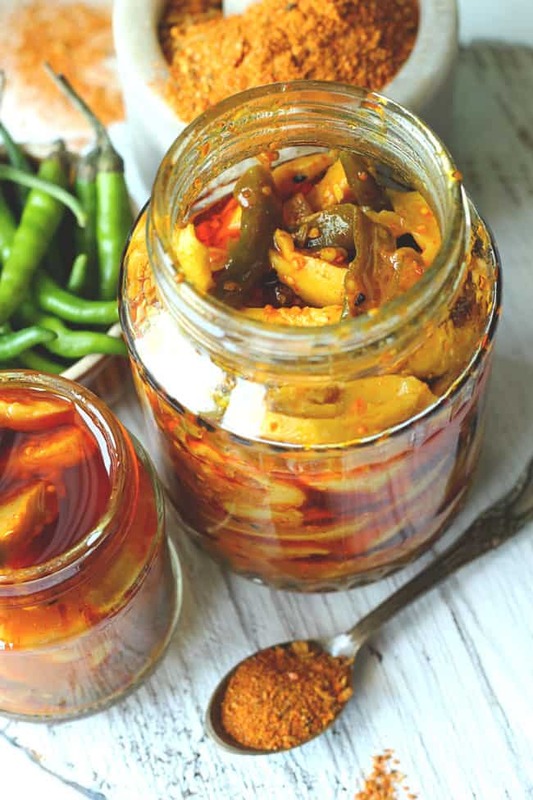 Instant Mango Pickle is a delectable mango pickle recipe that is ready to eat in less than an hour. Peel the mango and cut them into thin strips. Discard the stone. Combine the mango strips, salt and turmeric. Mix nicely. Leave aside for 1 - 2 hour or till the mango strips release their water. Drain the excess water from the mango strips and allow them to sit in a metal colander for 10 - 15 minutes. Now combine the mango strips, green chili, hing and achaar ka masala. Mix nicely. Add the mustard oil and mix the pickle nicely. At last, add the vinegar to preserve the pickle. Stir well. Now the pickle is ready to consume. You can serve it immediately. Store in a clean, dry jar at room temperature. The shelf life of an instant mango pickle is not more than a month. You can use the readymade pickle masala as well for the recipe.